The WARFIGHTER Dynamic Combat Trigger is precision machined and fully adjustable. Made from A2 tool steel with a Nitride coating ensures this trigger will last no matter what you throw at it. 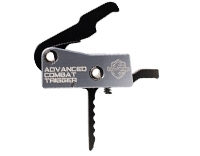 The WARFIGHTER Advanced Combat Trigger is revolutionizing the drop in trigger.